12 Acres with an outdoor range up to 200 meters. Indoor range up to 50 feet. 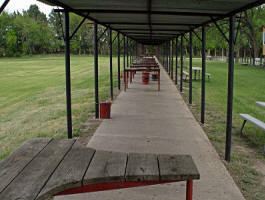 The Grand Island Rifle Club is one of Hall County’s oldest gun ranges. The club was founded in 1934 and articles of incorporation were filed in September 1934 with the State of Nebraska. The purpose of the club was among others, to encourage the sport of rifle and pistol shooting. We are located on west Potash Hwy in Grand Island, Nebraska.. The Club has 12 acres of land and maintains an outdoor range facility with a covered firing line for rifle, pistol and black powder with backstops up to 200 meters. We also offer an indoor range and clubhouse. The indoor range is a modern facility which has 7 firing points for various calibers and firearms with shooting distances up to 50 feet. We have an enclosed heated viewing and shooting areas. The indoor range and clubhouse are also multi-function facilities that are used for variety of purposes including meetings and classroom training. We welcome prospective members, or any interested persons who would like to learn more about the shooting programs and events at our club, to obtain more information, click on the membership tab at the top of the page. We are a private club and membership is available by application only.